Holy cow its been a while since I’ve done a post!! Sorry about that. Holidays and just the normal winter running around has threw me off a little! Hey really quick before I go into all the workouts that men and women can do in 30 minutes, let me ask a favor of you. Is that cool? When you get done reading this post…would you mind leaving me a comment? Let me know if this was useful for you and click the share button! Thanks. Ok so now on to the good stuff. The biggest question isn’t whether or not there are 30 minute routines you can do. Of course there is. The real question that most people want an honest answer to is…can I get in shape or stay in shape with only doing 30 minutes? The answer…YES! So before I loose your attention completely, I’ll list out below the workouts that are rated #1 for 30 minute workouts below that I’ll give you the scoop on how 30 minute workouts in some if not most cases can be more effective for you than an hour, and I’ll go into each listed workout a little to give you an idea of what they’re like. BUT remember, leave me a nice word or two in the comment box below! 30 Minute Workouts for Men and Women that are totally effective for anyone of any size, gender and experience. Ok so 30 minutes a day HUH? Can it really help me shred this fat and look good? Yes! How? Study after study shows that the most dramatic body transformations happen in the first 30 minutes of exercise. 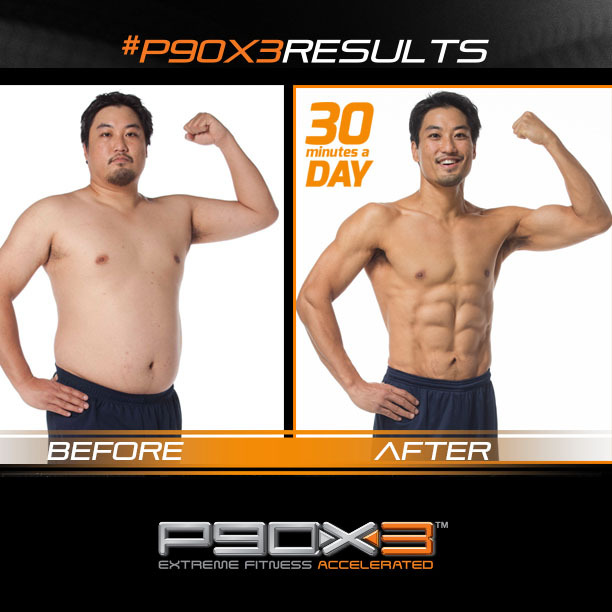 Tony Horton’s goal in X3 was to find a way to use that window of opportunity to help people get ripped, P90X ripped, in just half an hour a day. So lets just use P90X as an example. With P90X you have your first round of workouts, usually the first round is 30 minutes and then you repeat that in the second round to finish up your hour. So lets say most people burn out in the first 30 minutes and in the second round they need to have enough energy to make it through the workout but may have pushed to hard in the first round, so they are fighting against theirself. Therefor, having 1 30 minute workout that men and women can do each day or 5 or 6 days a week showed that they are effectively burning calories and get in amazing shape. Of course if you’ve read any of my other post you know what Im going to say next…nutrition is a must. It goes hand in hand with getting that body that you want. And the important thing to remember is that its not going to happen over night. Consistent workouts and nutrition WILL bring consistent results. But you’ve got to work at it! Now for those of you who PUSH hard for an hour or more each day, don’t hate me. Believe me, I love a good hour workout session. But lets face it. If you’re a single parent, a busy student, a busy parent, a busy business man/women or just don’t want to workout anymore than you have to, and you just want to be in shape and comfortable with your body, not pose for a magazine then a 30 minute workout IS the best solution and it does work! P90X3: This workout of course it 30 minutes and is 6 days a week with an optional 7th day workout. If you need extra time to warm up you can select that option and then move on to the workout. The workout itself is just 30 minutes. So you can get in and out and be done. If you’ve never used a workout from Tony Horton then let me break it down. Those of you who have will know what Im talking about. Tony (at least to me) is hilarious. He uses humor through the entire workout so its not boring at all. A LOT of the moves are centered around you own body and weight. Lots of balance building moves and believe it or not that burns fat and builds muscle, more so than going to the gym and using machines. (He actually says that) There are pull ups, which you can modify that with bands if you don’t have a bar. Simple things like dumbbells, weighted balls or even a basket ball, resistance bands and just you. Tony is the modern day Arnold Schwarzenegger, at least in my eyes. He knows his stuff. I highly recommend this to anyone. You don’t have to do any of the previous P90X workouts to do X3. Its well balanced and has an awesome and easy to follow nutrition guide. Its a great mix of cardio, MMX and resistance workouts. Better than any gym in my book! T25: Shaun T created T25. This dude doesn’t play around! Same scenario as X3. This is a 25 minute workout 5 days a week with a 3 minute cool down after each workout, so a total of about 28 minutes. Friday’s are whats called double days. So you do 2 25 minute workouts on Friday. It was a shocker for me when I got it. But I easily figured out on the Fridays that I only had 25 minutes to spare then I could make up the second workout on Saturday. The results weren’t hindered to my knowledge. The workout is I would say about 75% cardio. There are moves and workouts that use a light weight dumbbell or a resistance band. I love T25 durning that 90 days. Actually though, T25 is only a 60 day program with the option to get the Gamma series to extend it another 30 days. If you like lots of cardio, I recommend this workout. Again anyone can do this. All levels of fitness. I mean you gotta start somewhere right? X3 and T25 are great for starters to extreme fitness level. Good stuff. BodyBeast: Im not sure it’s fare to put this workout in the short workout category but Im going to anyway. This particular is based on building muscle. Don’t let that fool you though. You can lose weight and tone up with this workout. And believe it or not its quit popular with the ladies. And you don’t have to fear, if you don’t want to get bulky but simply ton and create muscle this is a great workout. You do need equipment though. You can check out my BodyBeast page to see what all equipment you need or search for some related post for some more info. As far as time, during the first 4 weeks I think the workouts are around 45 to 55 minutes. During your Bulk phase (don’t worry about the name) the workouts are 28 to 35 minutes. So kinda short. Either way I love this program. In fact Im testing my own BodyBeast/P90X3 hybrid right now. More on that in a later post. *21 Day Fix: What is 21 Day Fix? 21 Day Fix is THE fitness and nutrition program to help you lose up to 15 pounds in 21 days. Each workout is approximately 30 minutes a day, 7 days a week. The unique nutrition plan uses specifically portioned food storage containers that eliminate the guesswork from portion control – no weighing, measuring, or counting calories, carbs or points. If it fits in the container, you can eat it. And you’ll lose weight. When eaten in the right quantities, there are no foods that are off limits. Who can do the program? 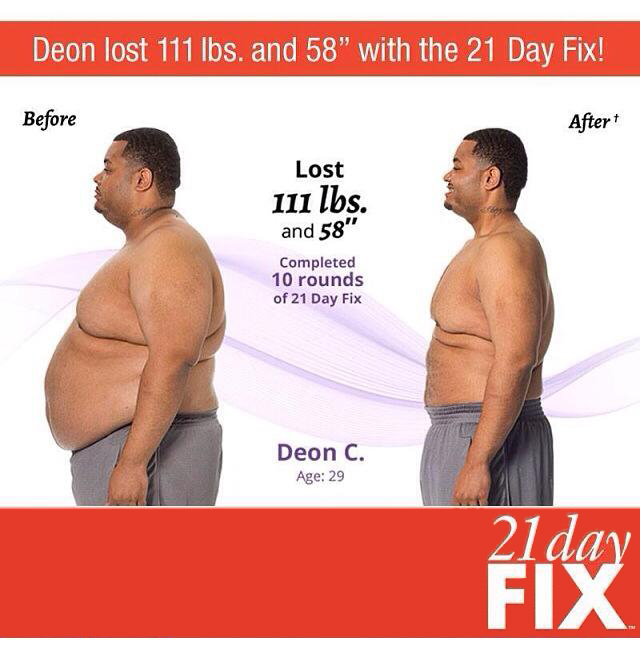 Everyone can do 21 Day Fix and get great results. Each workout has a modifier to show easier moves. The test groups included fit people as well as people with 100+ pounds to lose, to be sure that anyone could be successful with this program. Ok so theres the scoop. There are plenty of resource for workouts here to help you make an informed decision. Of course when you get one of the awesome workouts from this sight, you get me as your personal Team Beachbody Coach for free! If you want to turn fitness into a business, contact me and I’ll tell you all about how you can help people get healthy and fit, plus get paid for it. You don’t have to have experience or be in shape. You just have to be willing to learn and want to live a healthy lifestyle! Have a great day! Good luck on your journey! I hope to hear from you! Don’t forget to click share! If you want to know more about weight loss and body posture you can read this post from Posture Savvy. Hey Pat. I am thinking about purchasing T25. The only thing holding me back is my fear of losing muscle. I am 31 years old. 5’10” 255lbs. I have been an avid weightlifter most of my life but have gained a few pounds around the midsection. However, I started a new job that consumes about 50-60 hours a week. Plus I have a 1 1/2 year old daughter that is starting to keep me busy. I am tired of going to the gym after work and getting home at 6:30-7 p.m. Plus, I do martial arts 2-3 days a week and want to increase my cardiovascular stamina to keep up with the younger guys running circles around me because I get fatigued pretty fast. I want to start working out with my wife, who is struggling to lose her ‘baby’ weight, and feel T25 would be good for us given our hectic schedules. We have limited space in the house to do our workouts and not much equipment. My main concern is losing the muscle and strength I have worked so hard on the last several years. Hi Ace. Well through personal experience I can kinda relate. Being a Beachbody Coach I try to do all the workouts so I can give accurate reviews of them. When I did T25, I had just finished up Body Beast, so I had packed on some muscle as well. If you want my honest answer, I lost some muscle doing T25. Of course I gained in speed and overall stamina but because there isn’t a lot of weight lifting in the T25 program I did lose some muscle. Don’t get me wrong I was in amazing shape, but Im personally looking for a more muscular build right now. I like T25 a lot, but in all honesty its not the program for me. If you’re eating 100% the right way all the time you may can maintain some of the muscle. But expecting to keep it all I don’t think would happen. Of course once you get through to the beta and gamma rounds, you could add in some heavier dumbbells and that might help maintain some. P90X3 I know has a phase for adding muscle and of course its classic is phase for just getting cut and losing weight/inches. If you’ve read any of my post you’ll know Im a big Tony Horton/P90X guy. X3 is 30 minutes a day, and you can use dumbbells or bands in it like T25 so thats an option to keep in mind. My wife is on week 4 of X3 and I’ve been doing some of the workouts with her as well so I can see how you could maintain/build muscle with it. Since time is an issue you’ll have to pick a happy medium. Either way, T25 and X3 are incredible workouts. The 21 Day Fix is REALLY popular with people wanting to lose weight and currently struggles with food and portions. That might be a good starter for your wife also. I’ll be giving a full review on that in about a month or so. I hope this helps. If you need to brainstorm some more, shoot me another message or an email! Thanks Pat. I think I can stand to lose a little bit of muscle. My arms are 19″ and my chest is 54″ around. I want to get down to around 225-230 lbs. I think that would be the perfect weight for my endomorphic body type. I think I will give T25 a shot. If I can cut a bunch of fat and lose a little muscle I can handle that. After all its only 10 weeks. And if I like it I can do the Gamma phase which I understand uses more weights. If not I can go back to lifting and maintain my body weight or do X3 and try to get back some of the lost muscle while staying lean. My main goal though right now is to get that fat loss boost and take it from there. I think you’ll be pleased. Like you said in 10 weeks, you’ll know where the next step will be. Remember, you get me as your coach plus exclusive free gifts getting it from my site. The challenge pack is the biggest bang for the buck. Best of luck and let me know how things start out!